How can I watch 3D movies on Vizio TV from USB Flash Drive? Is there a program that can convert 2D to 3D movies for playing on Vizio LED 4K TV? In this article we will share the best 3D video converter with you, and you will get the easiest way to play 3D movies on Vizio TV from USB Flash Drive or External Drive. Nowadays 3D movies are hot, on the forums and websites there are a few of users want to watch 3D movies on their HDTVs, for example, some Vizio TV users want to convert 2D to 3D movies and then copy movies to USB Flash Drive, so that they can watch 3D movies on Vizio TV from USB port, but most users don’t know the effective tool to convert 2D movies to 3D, please don’t worry, in this article we will share the best 3D video converter with you, which will help you to convert 2D to 3D movies and then you can play 3D movies on Vizio TV from USB smoothly. An excellent 2D to 3D converter will help you to convert videos with top quality and speed, here we want to introduce the best 3D video converter for you, the software is Acrok Video Converter Ultimate, this software can convert 2D to 3D movies, or convert 3D videos to 3D format that supported by Vizio TV, there are a lot of HDTV users have purchased this software to convert videos to compatible formats for their HDTVs. This Vizio TV 3D converter has full support for latest Blu-ray movies, DVD movies and HD videos, you can rip latest Blu-ray and DVD movies to unprotected common videos for watching freely, or convert HD videos like MKV, AVI, WMV, MP4, MOV, M4V, MPG, MTS, etc. to any formats you need. With this Vizio TV 3D converter you can easily convert 2D or 3D videos to 3D compatible format for Vizio TV, and then you can watch 3D movies on Vizio TV from USB Flash Drive or External Drive. 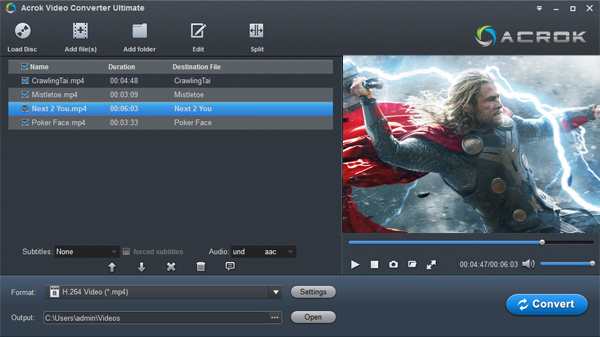 Just download Acrok Video Converter Ultimate and take a try! Step 1. Download Acrok Video Converter Ultimate from the product page, install this software on your Windows or Mac computer, both Windows version and Mac version are available to use, it will help you to convert videos to 3D for Vizio TV on Windows and Mac. Step 2. Run this Vizio TV 3D converter, it will show the main interface, click “Add Files” button on the top left corner you will be able to import HD videos that you want to convert; if you need to rip Blu-ray and DVD movies please click “Load Disc” button. Step 3. Choose Vizio TV USB supported video format for output. From Vizio TV user manual or product page you will learn that H.264 MP4 video is the best format for Vizio TV, so we recommend you to choose Common Video -> H.264 MP4 Video (*.mp4), this is the best compatible format for Vizio 4K TV, Vizio LED TV and other playable devices. Step 4. Add 3D effect if you want to convert 2D/3D videos to 3D format. Click Edit button on the main interface and then click 3D tab, then you can choose the 3D effect according to your need. Step 5. You can change the output settings by clicking Settings button on the main interface, and then you can adjust the resolution, bitrate, frame rate, codec or other parameters according to your need, for example you can set the bitrate as 2000 kbps – 4000 kbps, and adjust the resolution to 1920*1080, and then you can play 1080p 3D movies on Vizio TV. Step 6. Click convert button to start converting movies to 3D effect for Vizio TV. When the conversion is finished, click open folder button to get the converted 3D videos, transfer them to USB Flash Drive or External Drive, and then you can watch 3D movies on Vizio TV from USB Flash Drive or External Drive, there is no problems anymore. Just try it now! What is the best Windows 10 Blu-ray Ripper software? 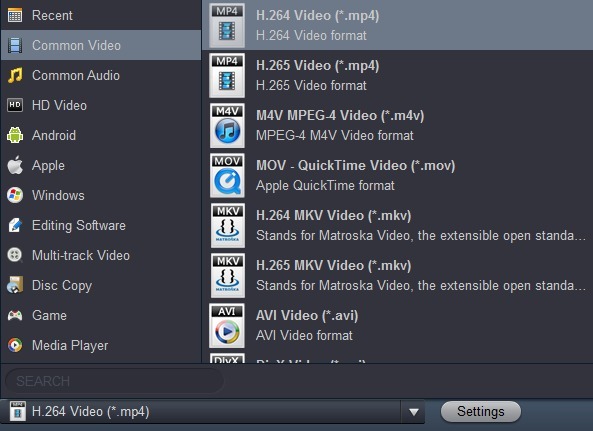 The MTS format is commonly used to store HD video on AVCHD and Blu-ray discs. Because of their high resolution, MTS files can get pretty large. To be played on portable players and other mobile devices, MTS files need to be converted to a more appropriate format. Acrok MTS Converter can easily undertake this task since it supports all popular video and audio formats, including MOV, MP4, MXF, AVI, MPG, WMV, MKV, M2TS, MP4, etc. Copyright © 2019 Acrok MTS Converter Studio. All Rights Reserved.